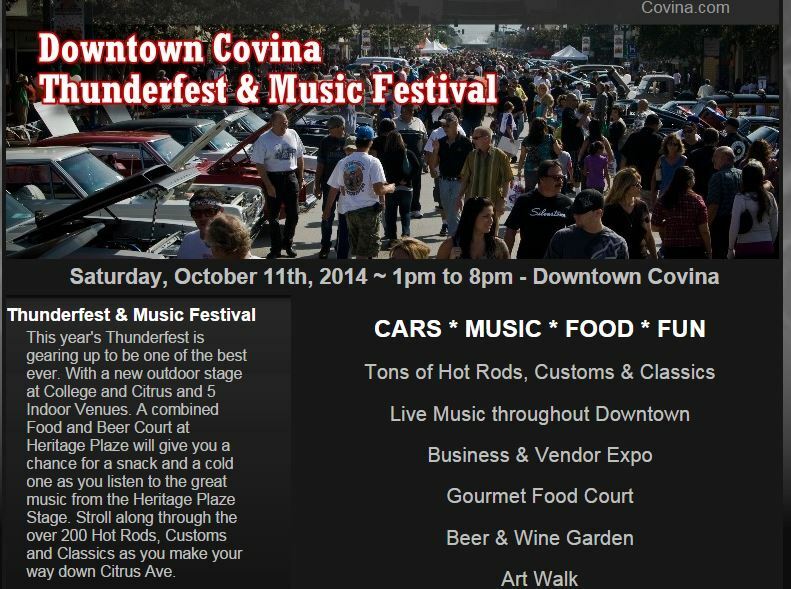 Covina’s 19th annual Thunderfest is Today!!!! It’s here! The day our beautiful city closes off Downtown Covina to car traffic and fills the streets with amazing bands, yummy food and over 200 cars! Its today from 1:00-8:00pm, see ya’ll there! This year’s Thunderfest is gearing up to be one of the best ever. With a new outdoor stage at College and Citrus and 5 Indoor Venues. A combined Food and Beer Court at Heritage Plaze will give you a chance for a snack and a cold one as you listen to the great music from the Heritage Plaze Stage. Stroll along through the over 200 Hot Rods, Customs and Classics as you make your way down Citrus Ave. Remember to follow us on Instagram @CovinaResidents and tag us on your Covina pictures! This entry was posted in Uncategorized and tagged Covina, Covina California, Covina Resident, music, Things to do around Covina CA, Yesenia Ruvalcaba by Yesenia Ruvalcaba-Garcia. Bookmark the permalink.